As the country shakes off its white blanket of winter and emerges, blinking and grateful, into the warm sunlight of spring, most Canadians are happy to swap their toques for T-shirts. 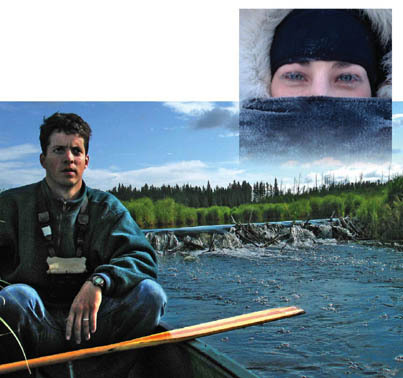 But while their peers are locating their sunscreen, many researchers at McGill bundle into their woollies and chase the receding frontier of snow into Canada’s Arctic, joining colleagues who visit the North year-round for their research. The image of the stark, unchanging landscape of the North is firmly lodged in the imagination of Canadians as a part of our national identity. In reality, it is undergoing dramatic transformation, in both environmental and human terms. Understanding the nature of these changes is as pressing a need for the people who live in the farther reaches of the country as it is for everyone else. The frozen North holds keys to understanding climate change, and geology professor Wayne Pollard is digging deep to find them. From early spring to late summer, Pollard, an ice archaeologist in the Department of Geography, may be found drilling in the permafrost at McGill’s High Arctic Research Station on Axel Heiberg Island in the Arctic Ocean. More than 50 per cent of Canada’s land mass is frozen year round, to depths of up to a kilometre. Knowing how much ice is present under the surface is a first step in predicting what type of changes will occur above ground as temperatures rise. “As permafrost melts, it will expose the ice, which will also melt; landslides, big holes and depressions will occur. Stable ground will become unstable. The area will look as if somebody went over it with a bulldozer,” says Pollard. This cartographer’s nightmare has a huge impact for northern communities: in the Yukon, Dawson City’s municipal works budget has increased by 50 per cent, in part due to damage caused to infrastructure by shifting permafrost. If the melting continues, the streets of towns like Dawson City could become impassable swamps dotted by islands of half-sunken homes. As part of the ArcticNet research consortium that evaluates the impact of this change on northern communities, Pollard might help stem the mucky tide. With funding from the Canadian Institutes of Health Research (CIHR), the Natural Sciences and Engineering Research Council (NSERC) and the Social Sciences and Humanities Research Council (SSHRC), ArcticNet is developing models to predict the amount of erosion and better understand the impact of climate change on northern people. The increasing impermanence of permafrost will have effects beyond broken sewer lines in the North. The frozen soil of the Arctic is a giant cold-storage unit of centuries’ worth of natural and unnatural contaminants like soil carbon and mercury. Once the permafrost breaks down, it opens a Pandora’s icebox, releasing these substances into the environment. Using a shallow drilling technique developed by PhD student Nicole Couture, Pollard’s team is measuring carbon levels in the ground of Axel Heiberg. The wind-lashed lands at the latitude of the island are hostile enough to life to qualify as Arctic desert. But surprisingly, beneath the surface, the permafrost is home to billions of micro-organisms, which thrive in unimaginable cold and darkness. Environmental microbiologist Lyle Whyte’s research team is studying these strange and little-known organisms in the hope of discovering novel microbes that will give us a greater understanding of the low-temperature limit of microbial life on earth. 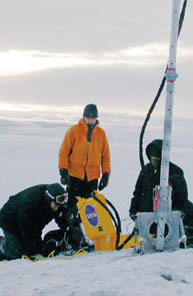 Whyte’s work is funded by NSERC, the Canada Research Chairs program and the Canada Foundation for Innovation, as well as the Canadian Space Agency and NASA—which are interested in the Far North because its harsh environs are an excellent stand-in for the frigid and barren surface of Mars for testing technology. He focuses on bacteria growing in two specialized environments: those that live in cold saline springs and those in the permafrost on Ellesmere Island. The high salt concentration—up to seven times that of seawater—in the springs means the water never freezes, even though the outside temperatures may reach –50ºC. Even more remarkable is that Whyte and PhD student Nancy Perreault have detected never-seen-before micro-organisms that produce hydrogen sulphide and methane, while others may be using those compounds as energy. Permafrost micro-organisms could have a real impact on the environment, especially climate change. “It is possible that following permafrost melting, the activities and populations of these bacteria will increase. They will produce more methane and/or carbon dioxide, creating a positive feedback loop on global warming,” says Whyte. Warmer temperatures will also have an effect on the larger creatures that make their home in the North. The margin of survival is razor thin in the harsh northern environment, making animals there especially vulnerable to climate change. 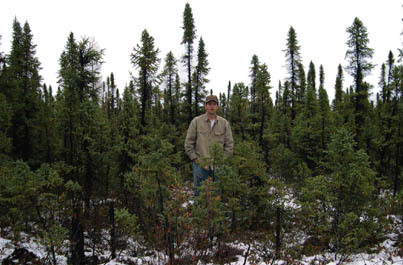 Wildlife biologist Murray Humphries studies mammal ecology and physiology in Canada’s North, but the experience of working in the Subarctic goes beyond simple science for him. “It’s really about the wildlife and trying to understand the world on their terms, not ours. People will say that I can only view wildlife through a human lens, but I think if we all spent more time in the North, we might change our minds. It has a way of shrinking the human condition,” he says. Every species has its own range of climatic tolerance—a comfort zone that determines where a species can survive. Warmer temperatures mean that animals can thrive at higher latitudes than in the past. This includes the ever-industrious beaver, which has colonized areas as far north as Ungava Bay, Quebec. “Normally, beaver are a boreal species surrounded by trees, but they are way up into the tundra landscape, in a narrow band of alder and willows along the rivers,” says Humphries, who is funded by NSERC, SSHRC and ArcticNet. His students are doing surveys to predict how far north Canada’s national rodent will get, and how quickly. This migration might seem like a good thing—the animals are, after all, expanding their range to thrive in new environments. On the other hand, it amounts to your neighbour moving into your house because you set the thermostat higher. Beaver, along with red fox and moose that have also settled in like unwelcome guests in the living room of the caribou and polar bear, are effectively invasive species in their new environments. This infiltration of the North is an acceleration of what has been happening since the glaciers retreated, which Humphries says may be related to the onset of increased industrialization. This territorial change of northern animals also concerns Harriet Kuhnlein and Grace Egeland, who are both affiliated with the McGill Centre for Indigenous Peoples’ Nutrition and Environment. They are encouraging communities in the North to rely less on store-bought “southern” food and more on traditional food harvested from the land, which Kuhnlein says the local population deeply appreciates. “Work on traditional food systems resonates well with communities, and especially with those still closely linked with their traditional food system,” says Kuhnlein. Delicacies like musk-ox steak are not something shoppers will find in the local IGA. Store-bought food might be more convenient than the traditional methods of hunting, but Egeland says that “market food has more trans- and saturated fat, lots of refined carbohydrates and less protein, and the usual shopping cart doesn’t include many fresh fruit and vegetables.” However, all recognize that market food is here to stay, and that better quality food in the stores, more income and wider education are all needed to use it in ways that don’t have negative effects on people’s health. McGill’s northern researchers all speak poetically of the vast beauty of the North, the wilderness and the northern lights. And while Egeland may have come for the research, she has learned some unexpected skills to take back home, citing a meeting she had with community leaders on Baffin Island.